An excellent mathematical resource, which combines both pictorial representations alongside abstract numerical understanding. This app allows children to visualise the concept, yet at the same time allows repeated practice at speed, developing mental fluency. A private tutor in your pocket! 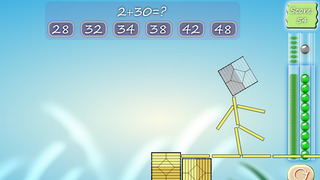 This app demonstrates mathematical concepts by combining both pictorial representations alongside abstract numerical understanding. Children are then able to practice by moving pieces, visualising or mentally constructing the process they’ve seen. The mathematical modelling shown alongside questions is excellent and really allows this app to stand out from the crowd. Upon opening the app children are invited to log in, while adults can enter the settings section through a simple divisibility test. In the children’s area, they have the option to learn or practice their counting, basic addition, subtraction or multiplication skills. 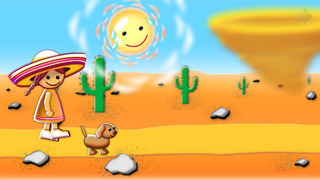 At the start of each game, users are given a guided example of how to complete the task in a visual way similar to how a teacher, tutor or parent would hold and count objects with children. Correct answers, at speed, earn points, while incorrect answers result in a helpful suggestion, a further incorrect attempt displays the correct answer, which the children must tap. This feature ensures that children learn from their mistakes, encouraging mastery of these skills rather than allowing gaps in their mathematical knowledge to emerge. 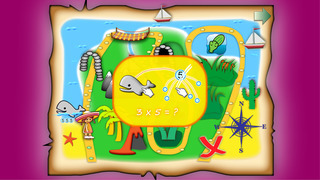 Children follow a treasure map indicating how far they have progressed through the skill ranges and are motivated through awards, mini games and ‘secret features’. They also develop intrinsic motivation as they repeatedly strive for, and are able to achieve, success. A further benefit is the ability to learn numbers in a foreign language and interesting concepts arise with different number systems, for example, that French numbers such as 76 are constructed from 60 and 16 or the simplicity of the Japanese number system. Upon initial testing, working through each section of the app can be time consuming, especially with the slight time delay switching between screens, yet when given to a child, they simply play, practice and learn. In the settings area, adults are able to control a range of options: sound, animations, mini games, passwords, player profiles, etc. To truly reap the benefits, adults should invest the time to explore these features, but also view demonstrations of each concept. Without this, there is the risk that children will ‘just play’ and repeat previously learned material. To appeal to a different audience and to maximise the apps commercial potential the developers may consider introducing a school or teacher app (with site licenses) which offers the ability to set up classes, track progress and identify where interventions are needed. This could be further developed to provide excellent offline printable worksheets. Overall an excellent app worthy of a 5* rating. • KidsCalculate combines the advantages of the Abacus, the Montessori Stacking System, the Bead String and the Number Line. • Funny and exciting game elements provide for many hours of gaming pleasure. • The innovative stacking system provides unprecedented clear insight into mental calculations. • Because of the smart drag-interface, it can easily be used on smartphones as well! ‣ All quantities are organised in a clear way in a single dimension. ‣ The numbers can be viewed as digits as well. ‣ The numbers can be heard out-loud. ‣ The visualised quantities can be manipulated. ‣ In an intuitive way, the manipulation game allows that either tens or units can be moved, yet never both of them at the same time. ‣ The manipulation game sheds insight into when tens are being formed or need to be broken up. ‣ The behaviour of the manipulation game makes sure that the basic techniques that are required for performing mental calculations are obtained in an intuitive and playful way. • The difficulty level can be adapted at will. • Real time adaptive feedback helps whenever needed. • An artificial intelligence can be called upon to demonstrate ways of solving the current exercise. • Campagnes with learning lines for specific skills and with adaptive progress. • Tons of cool animations, prizes that can be won and cutscene movies. • Mini games function as reward, as a break, and they provide a practical context to exercise the current skill. ‣ Up to 32 accounts per device. ‣ A lot can be configured. Like whether to allow sound, minigames or animations in the manipulation game, and whether timer speeds should be set tight for a specific student. 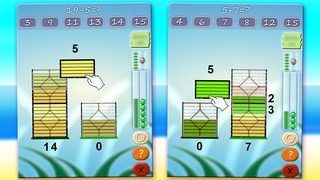 ‣ A "Remedial Teaching Detail Menu" allows the selection of series of very specific exercises, like for example "subtract from numbers that end with 5, for numbers of 0 to 50, with timer enabled and set to level 5". ‣ Student tracking and analysis system. Easily generate overviews of who's doing well, who's not, and why. ‣ Explanatorium. Quickly compose a specific exercise for teaching purposes.